My list of films I watched is ridiculously short this month, but here it is anyway. I finally saw One Flew Over The Cuckoo's Nest which was brilliant and I'm also still upset over how sad it was. And I thoroughly enjoyed the insane fashion in Staying Alive (check out James' blog post about the dance instructors amazing jackets). 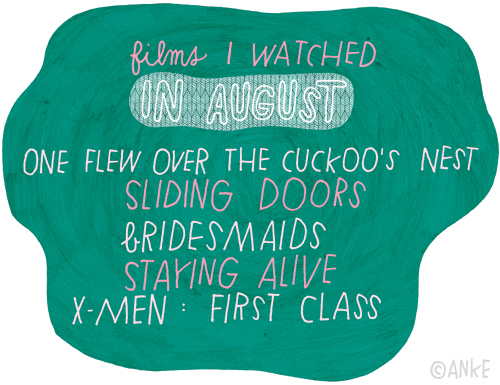 Hopefully there will be less weekends spent working and more time for movie watching in September!